Life is tough as a tornado. People call you a blowhard, and they’re not wrong. People tend to scatter when they see you coming. You’re constantly dizzy from all the spinning. You’re never allowed in china shops or any other place with fragile merchandise. Storm chasers are always following you around, gawking and making you feel self conscious. And finding an insurance provider willing to cover you is a real headache. All you really want to do is have one night where you can kick back with your friends like a regular person. But going to the movies isn’t an option, since you demolish the theater before the movie even starts. If you try to go to the pool, you accidentally start a tsunami. You’d just like one day where people don’t flee screaming from your approach. We’re afraid we can’t really help you there. But we’ve got another idea: why not embrace yourself and your unique… abilities? You were born this way, and you should be proud. It’s not everyone who can clear a 10-mile radius by just walking through, or destroy a building that took six months to construct. Instead of focusing on the negatives, look at the positives. You’re powerful. Breathtaking. Ferocious. You literally take the world by storm. Embrace your inner tornado in this Adult Tornado Costume. The while polyfoam tunic is overlaid with spiraled strips of black and white nylon netting, and it comes with cutouts that can be tucked behind netting strips as desired. 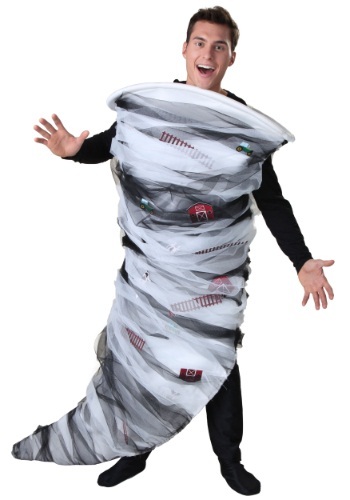 Slip into this costume and you’ll be turning heads—literally!